← My church…standing in a new light. The emptying of the ocean. Our oceans are drying up. In the 1970s, cod was so plentiful off the Atlantic coast, you could scoop them up with a bucket. Tuna was selling for a few cents a pound. Jaws was just a figment of Steven Spielberg’s imagination. And I was eating fishsticks for dinner on Friday nights, like the one billion people around the world who depend on fish for food. 40 years later cod, like most of the large predatory fish that are slow-growing and reproduce late, have been fished to the point of depletion. The mighty bluefin tuna, which can grow 15 feet long, weigh up to 2000 pounds and swim 55 mph, now sells for up to $340/pound and its stocks have been reduced by 90% –yet it’s still being hauled out of the ocean at a “managed” rate of 44 million pounds/year. And sharks that kill a grand total of 5-8 people a year are killed at a rate of 50 million annually. 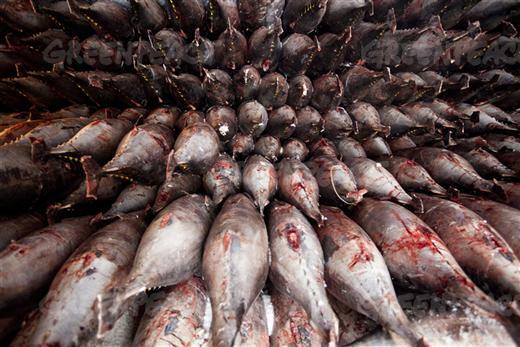 All this slaughter is not just a result of a global appetite for hon maguro sushi and shark-fin soup (although the Japanese are among the worst offenders in overfishing). The real culprits are environmentally negligent practices like bottom trawling, which destroys the ocean floor, coral reefs and habitat, and bycatch– up to 16 billion pounds of fish and marine mammals that are caught up in huge baited nets and then tossed back into the sea, dead or dying. It’s a crisis that has resulted in 96% of the oceans being damaged by human activity – and it’s time to do something about it. 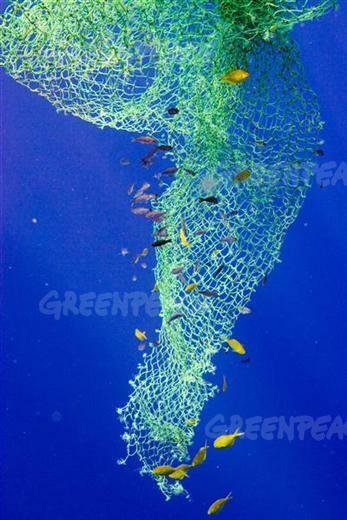 Greenpeace – those great folks who won’t let up, put up or shut up – is on the forefront of the effort to save our oceans. 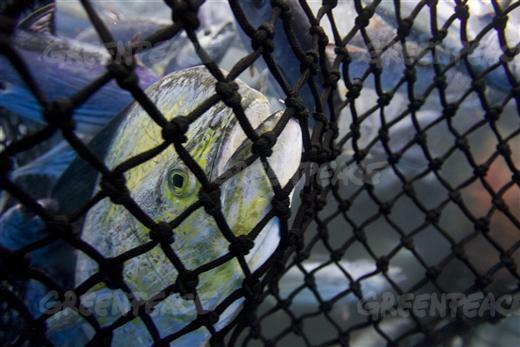 Because supermarkets are responsible for $16 billion in seafood sales, Greenpeace has decided to shame the worst offenders into sustainability. And it’s working! In March 2010 Trader Joe’s, bowing under intense pressure and lobbying from Greenpeace activists, pulled orange roughy (a critically imperiled, bottom-trawled fish) from its freezers and committed to implementing sustainable seafood practices. Yay, TJ’s! 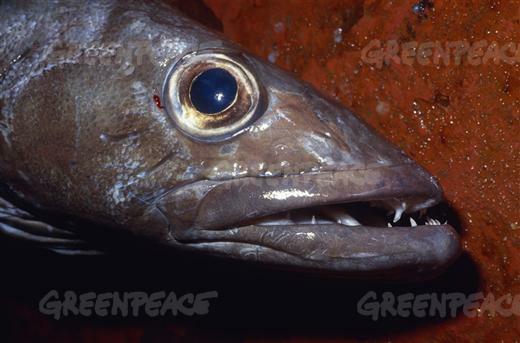 Now Greenpeace has Costco in its sights for continuing to sell 15 of the 22 red-listed seafood species, particularly endangered Chilean sea bass and orange roughy, and for lacking a sustainable seafood policy. 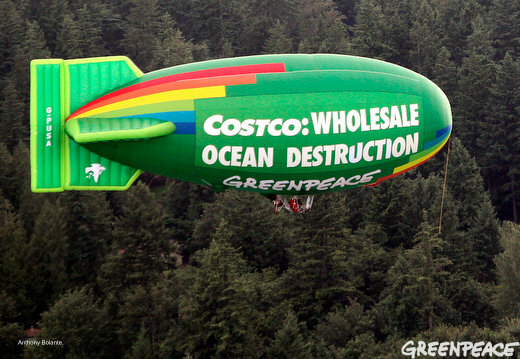 Considering that Costco is the third largest retailer in the United States and one of the largest seafood retailers, Greenpeace is clearly hoping to land the big one with its “Oh No Costco” campaign. Quite frankly, I didn’t even know there were 22 kinds of fish you shouldn’t eat (although I long ago repudiated fishsticks) – but now I do, and I’m in! You can print out a Seafood Watch pocket guide from Oceana (post 6/26) , or download a localized app for your phone from the Monterey Bay Aquarium. 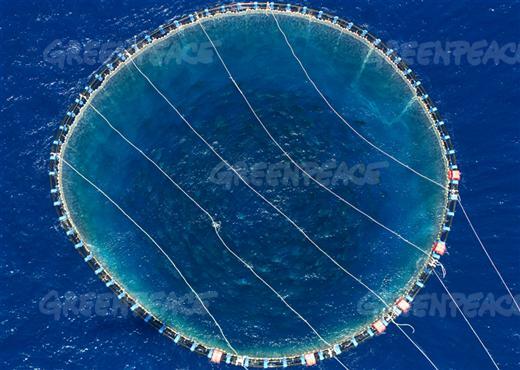 Or just curl up with Greenpeace’s riveting “Carting Away the Ocean” manifesto – rating all the major supermarket chains on sustainable seafood practices. I don’t eat any fish and I certainly know very little about the industry, so I’m speaking from a distance. But it seems that people who make their living through the sale of fish would be very concerned about wiping out stocks, if only from a business perspective. Just as paper companies plant new trees — whether out of consideration for the Earth or to ensure continued supply, I don’t know — wouldn’t fish-related businesses be interested in future sales? It isn’t like oil, which can’t be replenished. If you fish right, there’s an unlimited supply. I’m really curious, now, to hear the other side of this story. Even if you ignore the impact on the ocean, there’s a lot of money at stake here. What is the fishing industry saying about its future? Thanks, Betty, for another informative post. Thanks for giving us some good news. Yaay for TJ’s! SHAME ON YOU Costco that 15 of the world’s endangered fish are in your fridges and freezers.